Turkish Airlines is an Istanbul based airline carrier and is the national flag carrier for Turkey. Started in 1933, Turkish Airlines operates flight services from its primary hubs in Atatürk International Airport, Turkey. The airlines is part of the Star Alliance group from April 2008 onwards, Turkish Airlines has so far handled more than 17 million passengers back in 2006. The airlines operates scheduled international and domestic flight operations to more than 107 cities throughout Europe, Asia, Africa and United States and 32 domestic cities. 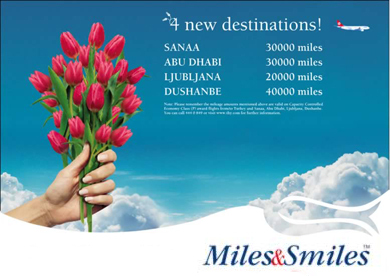 Turkish Airlines' frequent flyer program is known as Miles and Smiles. 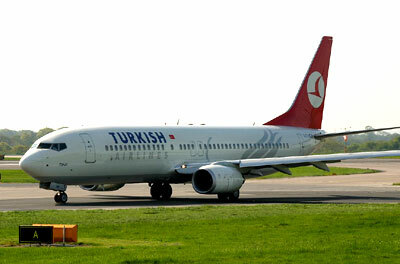 The airline company employs 12000 workers and the company's headquarters is at Istanbul, Turkey. Turkish Airlines signed codeshare agreements with other airline companies such as Air China, Air India, Japan Airlines, Lufthansa, Pakistan International Airlines and American Airlines. With a strong 100 aircraft to its fleet, Turkish Airlines aircraft types and models include Airbus A310-200/300, Airbus A319-100, Airbus A320-100/200, Airbus A321-100/200, Airbus A330-200, Airbus A340-300, Boeing 737-400 and Boeing 737-800. The freigher service aircraft for Turkish Airlines is known as Turkish Airlines cargo and operates freight services to Asia, Middle East and Europe using its Airbus A310-300F aircraft. Check flight schedule, flight status directly from Turkish Airlines official website. You can also check on the cheapest airfare, flight schedule, flight status, airlines offices, contact number, airlines packages, air cargo partners, air ticket prices and booking procedure, international airfares, frequent flyer and other flight information and travel deals and packages. When you are making an airfare booking, select from either economy airfares, business class airfares or first class airfares whichever you prefer. Have a pleasant flight journey and enjoy your holidays or business trip!